The hip is a synovial articulation between the head of the femur and the acetabulum of the pelvic bone, which connects the axial skeleton with its lower extremity. Though similar to the shoulder joint, the multi-axial hip joint is designed for stability and weight bearing rather than mobility. Movements of the hip joint are flexion, extension, abduction, adduction, medial and lateral rotation, and circumduction. The adult hip bone or acetabulum is formed by the fusion of the ilium, ischium, and pubis. This occurs by the end of the teenage years. The hip joint consists of the cup-shaped lunate surface of the acetabulum, and the ball of the femoral head. The femur is almost entirely encompassed by the socket of the acetabulum, which contributes to the joint’s stability. The latter’s grip is further augmented by the acetabular labrum, a ring-shaped fibrocartilaginous lip. A fibrous membrane that is strong and thick, yet loose enough to allow various range of movements, covers the hip joint. It is lined by the synovial membrane and reinforced externally by three ligaments: the iliofemoral ligament, the pubofemoral ligament and the ischiofemoral ligament. The fibers of these ligaments are all oriented in a spiral manner around the hip joint so that they become taut during extension. This allows less amount of energy to be expended while maintaining the standing position and increases stability. Articular branches of the obturator artery, medial and lateral circumflex arteries, superior and inferior gluteal arteries and the first perforating branch of the deep artery of the thigh, form a network around the hip joint to supply it. Muscles associated with the hip joint are innervated by the femoral, obturator, superior and inferior gluteal nerves as well as the nerve to the quadratus femoris muscle. The thigh is the region of the free lower limb that lies approximately between the hip and knee joints. Its boundary between it and the abdominal wall is demarcated anteriorly by the inguinal ligament. Posteriorly, it is separated from the gluteal region by the gluteal folds. The bone framework of the thigh is comprised of the femur, the heaviest and longest bone in the body (about a quarter of a person’s height). It transmits weight from the hip bone onto the tibia bone when a person is standing. However, most of the large muscles of the thigh insert into the proximal ends of the tibia and fibula (bones of the leg). The thigh is divided into three compartments by intermuscular septa into anterior, posterior, and medial compartments of the thigh. The anterior compartment consists of muscles responsible for leg extension at the knee joint. It includes the sartorius muscle (the longest muscle in the body) and the four large quadriceps femoris muscles: the rectus femoris, vastus lateralis, vastus intermedius, and vastus medialis, and is innervated by the femoral nerve. The posterior compartment consists of muscles that extend the thigh at the hip joint and flex the leg at the knee joint. These muscles are termed the ‘hamstring’, and are innervated by the sciatic nerve. The medial compartment includes muscles that are mainly responsible for thigh adduction at the hip joint. These six muscles are the gracilis, pectineus, adductor longus, adductor brevis, adductor magnus, and obturator externus. They are all innervated by the obturator nerve except for the pectineus (femoral nerve) and part of the adductor magnus (sciatic nerve). The thigh is supplied by the femoral and obturator arteries. The former is the largest and supplies most of the lower limb. 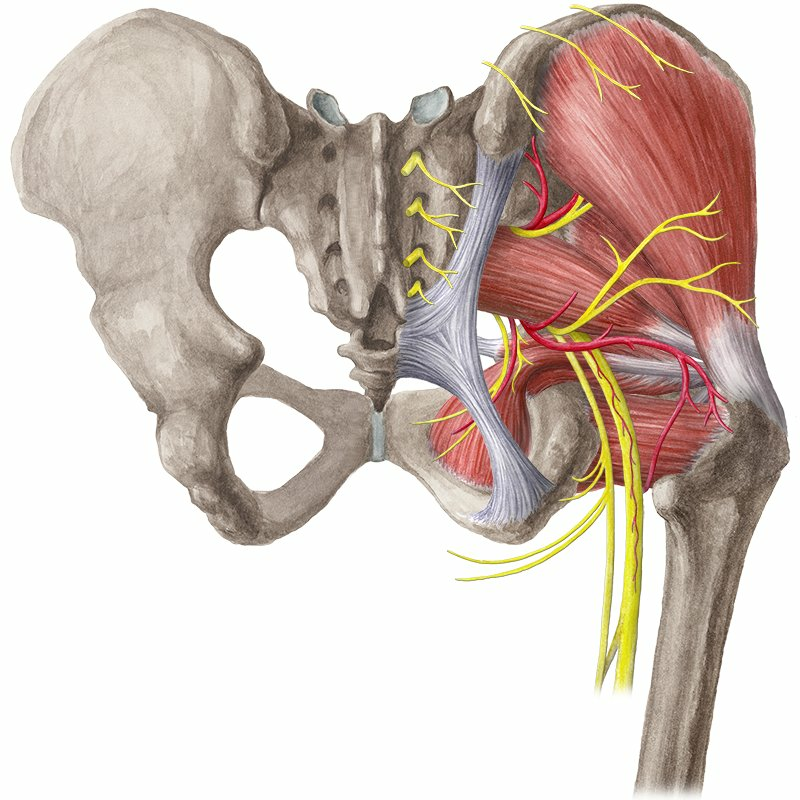 Want to learn more about the Hip and thigh? Anterior, posterior, medial and lateral views of the pelvic bones. Anterior and posterior views of the femur.